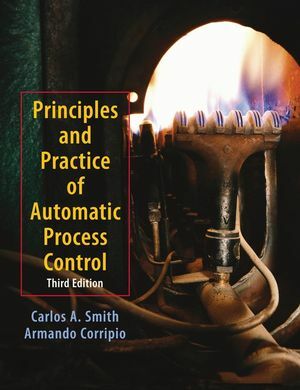 Highly practical and applied, this Third Edition of Smith and Corripio’s Principles and Practice of Automatic Process Control continues to present all the necessary theory for the successful practice of automatic process control. The authors discuss both introductory and advanced control strategies, and show how to apply those strategies in industrial examples drawn from their own professional practice. The strengths of the book are its simplicity, excellent examples, practical approach, real case studies, and focus on Chemical Engineering processes. More than any other textbook in the field, Smith & Corripio prepares a student for use of process control in a manufacturing setting. 2. Mathematical Tools for Control Systems Analysis. 5. Basic Components of Control Systems. 6. Design of Single Loop Feedback Control Systems. 7. Tuning of Feedback Controllers. 8. Root Locus and Frequency Response Techniques. 10. Ratio, Override and Selective Control. 13. Dynamic Simulation of Control Systems. Appendix A: Instrumentation Symbols and Labels. Appendix B: Design Case Studies. Appendix C: Sensors, Transmitters, and Control Valves. Appendix D: Tuning Case Studies. Appendxi E: Operating Case Studies. An ideal balance between classical control theory and applications. Practical applications of advanced control strategies. The material is presented in a way that Chemical Engineering students can understand and relate to. Comprehensive explanations of controllers and their tuning. Integration of process simulation, instrumentation and control. Clear presentation of process characteristics, modeling,instrumentation and control valves. Design control schemes for process plants. Applied presentation of computer control techniques. Strong emphasis on understanding the dynamic response of the process, and then applying control techniques. When students learn to model, in the first half of the course, the second half (controls) is easier for them because the proper foundation has been laid. Facilitates students’ understanding of the development of a block diagram from process fundamentals, reinforcing their understanding of process.